By Corey R. Matthews, D.O. and Jeremy S. Fullingim, D.O. A 38-year-old runner presented to her primary care physician with chronic left shin pain that was aggravated by running. After normal radiographs, an MRI was obtained. 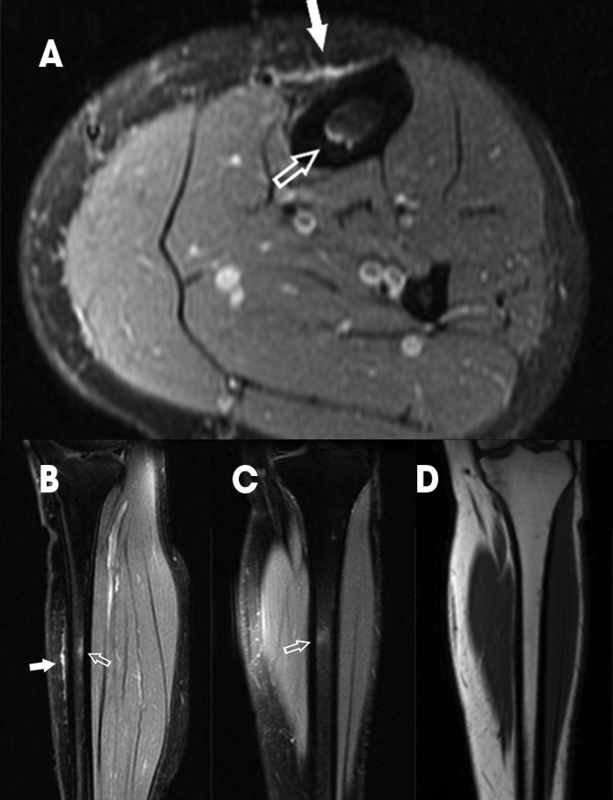 Fat-suppressed proton density images (A-C) demonstrated hyperintense pretibial periosteal edema-like signal (solid arrow, A and B) with mild focal increased marrow signal in the adjacent tibial diaphysis (open arrow, A-C). Marrow signal on T1-weighted imaging (D) was normal with no discrete fracture seen. These findings highly suggested grade II medial tibial stress syndrome (MTSS). MTSS is a painful condition that is most commonly self-limiting and usually improves with conservative therapy. It tends to affect athletes, especially runners, and likely represents a stress reaction from repetitive microtrauma. MTSS is more common in females and is often recurrent. MRI findings and their associated classification (Fredericson) are as follows: periosteal edema only (grade I), periosteal edema with increased marrow signal on T2 (grade II), periosteal edema with increased T2 signal and decreased T1signal (grade III), and multiple nonlinear (grade IVa) or linear (grade IVb) cortical signal changes. These grades positively correlate with the time required for complete healing, with grade I taking 2 to 3 weeks, grades II-IVa taking 6 to 7 weeks, and grade IVb taking 9 to 10 weeks or more.1,2 Contrarily, pain level with activity negatively correlates with both time to complete healing and MRI grade severity.1 Therefore, MRI has better prognostic utility for athletes with suspected MTSS than clinical history alone. Additionally, MRI can help rule out acute fractures, muscle injury, and other less common causes of shin pain. Beck BR, Bergman AG, Miner M, et al. Tibial stress injury: relationship of radiographic, nuclear medicine bone scanning, MR imaging, and CT severity grades to clinical severity and time to healing. Radiology 2012;263(3):811-818. Kijowski R, Choi J, Shinki K, et al. Validation of MRI classification system for tibial stress injuries. Am J Roentgenol 2012;198(4):878-884. Matthews CR, Fullingim JS. JAOCR at the Viewbox: Medial Tibial Stress Syndrome. J Am Osteopath Coll Radiol. 2018;7(3):35. Corey R. Matthews, D.O. and Jeremy S. Fullingim, D.O. Dr. Matthews and Dr. Fullingim work with the Department of Radiology, Oklahoma State University Medical Center, Tulsa, OK.